Managing Python development environments can be tricky, especially if you are new to the language or less familiar with computer science concepts. If you are stuck and in need of some guidance, this guide walks through using conda, a virtual environment manager, to get you access to the Descartes Labs programmatic APIs while accessing other compatible opensource Python modules. This is far from the only development environment that works, and in fact, is not preferred by all our users. Other package management systems allow for more control over module versions, which can be necessary to run our most advance features. This guide merely details one popular option for working within your environment to avoid headaches and suggests best-practice project setup. The basic Descartes Labs Platform instructions can be found on the Installation page. Authentication should be a simple one-time process of running descarteslabs auth login, which will prompt you to add a API token to your computer’s configuration. conda is an environment management system, a package manager, and a repository of pre-compiled packages. When you install one module using conda, such as JupyterLab, all of the required modules will also be downloaded and installed with compatible versions. While there are multiple ways to install conda, we recommend miniconda, the most lightweight and bare-minimum approach to using conda. Installing packages is straightforward, as it resembles the syntax of pip, and is compatible with pip. If conda does not host a module, or you want to install a package currently under development (such as ours), you can install it using pip or from source. Here is an example of using conda to install the Descartes Labs Beta library along with the popular plotting package, matplotlib. This will create an isolated work environment, though best practices would have you create a different environment for every project as described in the section below. To create a new conda environment, -n sets the name of the environment. The -c denotes a channel, or repository from which to pull compatible package dependencies. conda-forge is a widely used and reliable channel for installations. To add additional packages to your environment, you activate it from anywhere as seen on the second line above. Once activated, you can begin installing packages via conda and pip. For more information on using conda, check out the conda documentation. 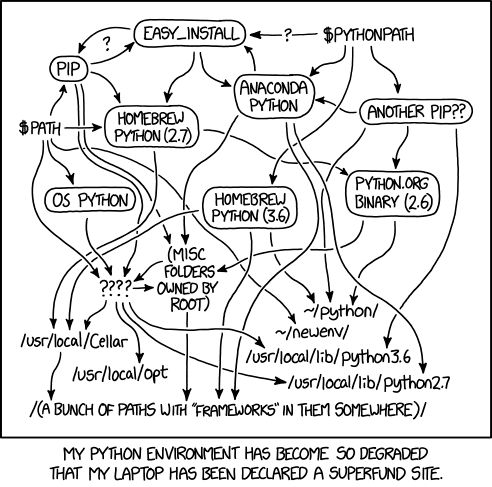 The popular webcomic xkcd captures the difficulty of maintaining Python development environments below.